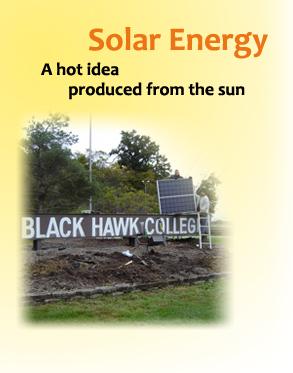 Solar energy is one of the frontrunners in the sustainable energy field, and Black Hawk College is incorporating this technology into the classroom and on campus. This picture shows the installation of a new solar panel at the BHC entrance and exit near Moline’s John Deere Expressway. The BHC solar energy panels are Photovoltaic (PV) or “solar cells” and are used to capture the sun’s rays and turn it into electricity. An example of photovoltaic conversion is demonstrated in something you may see nearly every day, like road construction signs equipped with solar panels for lighting at night. Students in BHC’s Engineering Technology classes and programs (especially the Sustainable Energy program) will benefit from hands-on training in solar technology. Another prime example of solar technology can be seen in solar power plants, becoming increasingly prevalent in the Southwest. Here, hundreds of solar panels use the sun’s thermal energy to heat a fluid, which then produces steam to power a generator. 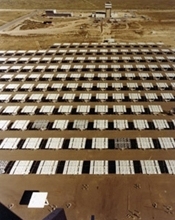 Most of the solar power plants in the US are located in California. Knowledge of the principles of science, engineering, and math to help solve problems; ability to read electronic schematics and mechanical drawings or interpret written/verbal instructions on your own, with little outside help; basic knowledge of typical computer software. Whom to call: Contact Advising at the Black Hawk College Quad Cities campus: (309) 796-5100, or ADVQC@bhc.edu.